If you’re like me and you cut your teeth on PLC/5’s and SLC 500’s, then you may find RSLogix 5000 is a little less, er… colorful than you might otherwise be used to. I certainly preferred the older color scheme, so I’m writing up this little note about how to set the RSLogix 5000 colors match the RSLogix 5 and RSLogix 500 colors. 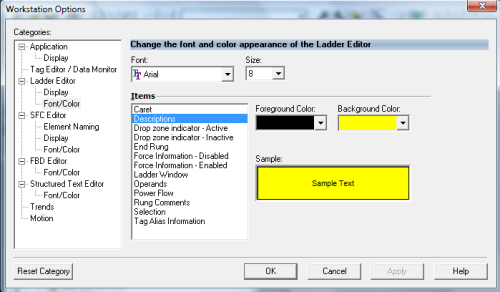 Select “Font/Color” under “Ladder Editor” in the tree on the left. Click on “Descriptions” in the Items list box, and then use the Background Color drop down box to choose yellow as the description color. You can do the same for Rung Comments lower down in the Items list. Click OK when you’re done. We both like it on the watershed, less noise. Ten fore.